In his keynote lecture for the Chronic Wounds section of the Symposium, Mr Paul Hayes (Addenbrooke’s Hospital, UK) presented data from a pilot prospective randomized controlled trial to evaluate the effectiveness of ReGenerCell™ in combination with compression therapy for the treatment of venous leg ulcers (VLU). Mr Hayes estimates that in vascular surgery departments, patients with VLU consume 10-20% of clinic time. VLU occur in approximately 1% of the US population , but this is increasing owing to an aging population and an increasing incidence of obesity . By 80 years the incidence is approximately 8%. In VLU the skin breaks down and does not heal as a result of insufficient venous return. Mr Hayes explained that VLU are slow to repair and even when treated with compression therapy, some wounds fail to heal within 24 weeks [9, 10]. The patients experience pain, swelling, itching, discharge and recurrent infection. In turn this has a significant impact on Quality of Life (QoL). The aim of this pilot study was to treat VLU failing compression therapy with RES produced by ReGenerCell™. Mr Hayes is hopeful that treatment with RES ReGenerCell™ can turn such wounds around – it offers a clear economic impact for health services and has an important impact on patients. Mr Hayes described the study design, which included 52 patients with VLU across seven centers in Europe. Patients meeting the inclusion criteria entered a 2-week run-in period to ensure consistent compression bandaging across sites and assess for rapid healing or infection. At the end of the run-in, eligible patients were randomized to receive treatment with RES in addition to compression therapy (active) or compression therapy alone (control). Patients were followed for 14 weeks, measuring wound size, wound images, pain and assessing QoL using the Charing Cross Venous Leg Ulcer quality of life questionnaire (CCVLUQ) . For analysis the active and control groups were further stratified into small ulcers (≤10cm2) and large ulcers (>10cm2). Patients enrolled on the study had an average age of 69 years. The median duration of the ulcers was 68 weeks; the average size of the small ulcers cohort was 5.8cm2, the large ulcer cohort 22.8cm2 (min. 2.0cm2, max. 43.0cm2). Most patients presented with comorbidities and these included well-controlled diabetes, peripheral arterial disease, arthritis and cardiovascular disease. Mr Hayes presented data that demonstrated some of the ulcers achieved 100% closure by 12 weeks; there was a positive trend towards wound closure but this did not reach statistical significance. However, positive changes in re-epithelialization were observed in RES-treated large ulcers by week 4, which reached statistical significance by week 14 (p=0.01) (Figure 2). In the small ulcers cohort effective healing on both the control and active groups was observed and Mr Hayes remarked that this was not unexpected and most likely due to good compliance of the patients with their compression therapy for the duration of the study. Of particular note Mr Hayes felt the decrease in pain (p=0.017) the patients experienced within 2 weeks of treatment with RES was significant; a benefit not seen in the control groups (Figure 3). In addition, positive improvements in all the measured areas of the RES patients’ QoL were observed, although the study was not powered to demonstrate significance in this measure. Mr Hayes summarized that the pilot study had demonstrated statistically significant improvements in wound size, pain and health-related QoL. Treatment with RES places wounds on a healing trajectory; this was of particular note in large ulcers (>10cm2), which comprise the majority of VLU presenting clinically. Strong results support progression to a pivotal trial, in which patients should be followed for 26 weeks rather than 14 weeks, and include a greater proportion of large ulcers. The study should also include a consistent method of wound bed preparation. Mr Hayes concluded that chronic VLU have a huge impact on the patient's QoL, as well as the economic burden to health services. In this study, autologous regenerative cell suspensions have shown a significant benefit for patients in terms of QoL and ulcer healing. Mr Harvey Chant (Royal Cornwall Hospitals Trust, UK) discussed his experience working with diabetic foot ulcers, most of which focuses on amputations for both minor and major indications. Complex foot wounds can be caused by a combination of factors, including trauma, ischemia, infection, renal failure and neuropathy. Diabetes is also a significant cause of complex foot wounds, with 15-25% of patients experiencing a diabetic foot ulcer in their lifetime . These diabetic wounds often take months, if not years to heal, with significant impact to the patient and health service. In this review of his experience of using ReGenerCell™ as part of his practice, Mr Chant presented the cases of seven patients with diabetes who had complications arising from neuropathy and ischemia. The team treated the patients in the unit’s podiatry clinic and used a combination of negative pressure vacuum therapy to encourage granulation followed by RES produced using a small full-thickness skin sample from the same patient. Of the patients presented, five healed completely with good quality skin forming over the wound. One of the patients developed vascular issues unrelated to the treatment of RES and required amputation of the affected limb. Mr Chant described that one patient had received aggressive wound cleansing 1 week post-treatment by a health professional who was unaware the patient had received the ReGenerCell™ procedure. This patient failed to heal and Mr Chant suggested that the inadvertent removal of the newly regenerating epithelium was the cause. Mr Chant also presented a complex foot wound that although not a diabetic foot wound, had many similarities and based on his previous experiences, led him to use ReGenerCell™ in this instance. Mr Chant presented the case history of a 62-year-old patient who had pneumococcal sepsis requiring high doses of inotropic and vasopressor agents. Her fingers were ischemic and feet necrotic. Her right foot was unsalvageable as a result of necrosis so a below-the-knee amputation was carried out. Her left foot, however, had a healthy, intact fat pad, meaning the foot could be saved (although toes were removed). The patient was given one treatment of ReGenerCell™ followed by Telfa® Clear covered with saline-soaked gauze in dressings to create a tension bandage. At 4 weeks post-treatment the foot was beginning to heal, and at 8 weeks epithelialization could be seen. At 19 weeks post-treatment her foot was healed, but standing not achievable. Mr Chant believes that once the Achilles is extended she should be able to bear weight on the foot, so it was deemed a successful treatment for a patient in whom it would have been difficult to do a skin graft. Mr Chant concluded that in his experience ReGenerCell™ had resulted in limb salvage and is a useful, cost-effective therapy in difficult-to-treat patients with complex wounds and multiple comorbidities. Echoing Mr Chant’s presentation, Mr Jeremy Rawlins (Fiona Stanley Hospital, Australia) asserted that a multidisciplinary approach to chronic wounds is essential and drew on his experience of managing difficult wounds in both Australia and the UK. Understanding the wound, the patient, and the difficulties the patient will have with that wound is key. Mr Rawlins also explained that an understanding of what the patient expects from treatment should be the priority. No person wants to live with a chronic wound, but the impact of the treatment on QoL must be considered. Mr Rawlins presented a number of cases including chronic wounds on the scalp, abdomen and lower limbs using a combination of treatments including negative pressure vacuum therapy, hyperbaric oxygen and skin grafting techniques, all in combination with cell suspension produced from ReGenerCell™. Mr Rawlins presented the case of a patient with a chronic wound to the whole top of the scalp following a traumatic injury. The wound was of mixed depth, both full and partial thickness. The full-thickness injuries were treated with full-thickness skin graft. In an attempt to minimize donor skin and preserve dermis, the mixed-depth areas were treated with meshed split-thickness skin graft and RES. Mr Rawlins then described the application of ReGenerCell™ in postsurgical oncology patients. An elderly patient presented with an open chronic wound to his upper posterior thigh, which had developed following surgery and radiotherapy for sarcoma. As a result of this treatment and other comorbidities the patient was high risk for further general anesthesia, but both patient and clinician were keen to close the wound. The surgeon felt treatment with a meshed skin graft together with RES produced from ReGenerCell™, performed under regional anesthesia, was appropriate for the patient. The procedure was successful and the wound fully healed within 10 weeks. Mr Rawlins presented the case of a male patient with a large VLU that was unresponsive to compression therapy, but who was compliant and willing to participate in an intensive course of hyperbaric oxygen therapy. The wound was debrided and covered with widely meshed split-thickness skin (3:1), followed by RES. The patient responded well and complete healing of the ulcer and donor site was achieved by 8 weeks.The patient did not experience ulcer recurrence at this site . A final case showed the treatment of a patient with complex wounds to both legs following a road traffic accident. The patient had undergone a series of repeated procedures over several months and was psychologically depressed, malnourished and anemic. On his left leg the patient had received a failed free flap followed by fasciocutaneous flap and skin grafts; in addition the bones were not knitting and he had considerable skin defects to both legs that were not healing. After discussion with the patient, Mr Rawlins and his colleagues felt that, due to infection, the patient’s best option was amputation of his left leg. However, the team was able to use skin from the amputation to mesh graft and produce RES to cover the skin defects on the right leg, successfully achieving wound closure while avoiding generating an additional donor site wound. After many months of treatment the patient is now mobilized and his mood improved considerably. In summary, Mr Rawlins stated much of his success is owing to good interdisciplinary teamwork, choosing the right treatments for the patient and regularly discussing the treatment with the patient to ensure the best possible outcomes in these often life-changing injuries. Mr Tomàs O’Neill (Leeds General Infirmary, UK) presented a case study of a patient with a very painful VLU. Mr O’Neill explained that from the literature a trend of effectiveness of ReGenerCell™ in lower limb chronic wounds was emerging and led his team to use the device to treat an 81-year-old lady, a retired GP with an ischemic and chronic VLU on her right leg. The patient had been an inpatient and bedbound for months and suffered severe pain on dressing changes owing to the high volume of exudate. Even with opioid analgesia she found dressing changes distressing. The wound was colonized by Pseudomonas and the skin quality of the surrounding tissue was poor. Angioplasty effectively improved inflow but the ulcer remained static for 6-8 weeks. Despite compression bandaging there was no evidence that the wound had epithelialized. Debridement, dressage and honey larvae therapy were also unsuccessful. The patient, her family and the anesthetist felt a graft under general anesthesia was too high a risk. Therefore Mr O’Neill and colleagues performed a limited debridement and wash to reduce bacterial load under diluted local anesthesia. A small 4cm2 split-thickness skin graft was taken from her upper thigh and used to produce RES using the ReGenerCell™ device and applied to the wound (Figure 4). Following treatment the most notable difference was the immediate absence of any analgesia postoperatively for dressing changes and the patient reported a total level of comfort during each dressing change. The patient herself reported that the absence of pain during dressing changes made the single greatest positive impact on her life. Over the course of 3 months the wound re-epithelialized and good-quality skin formed. 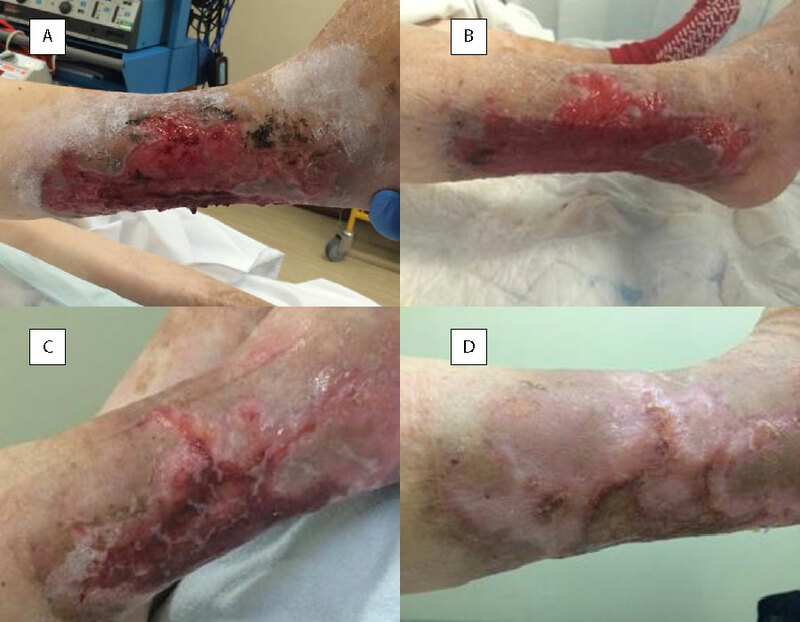 At 2 months post-treatment the patient became less compliant with her dressings and compression, and a superficial infection occurred. However, after discussions with the surgeons and compliance with compression dressings the wound closed fully by 3 months post-treatment. She was also no longer bedbound and could walk independently with a stick. In this case and in accordance with the observations by other authors and the ReGenerCell™ VLU randomized controlled trial, treatment with RES reduced pain in the VLU and led to improvements in QoL. Ms Gail Curran (Addenbrooke’s Hospital, UK) followed Mr Hayes’ presentation on the ReGenerCell™ randomized controlled trial by discussing the wound care regimens used during the study, which contributed to the effective healing and decrease in pain of the RES-treated patients. In the vascular outpatient clinic, patients in the control and treatment arms of the study had their ulcers irrigated with sterile saline and local anesthesia (to manage the pain) and scrubbed using sterile gauze to pinpoint bleeding. A full thickness skin sample was taken from either the hip or abdomen, disaggregated using the ReGenerCell™ device and the resulting cell suspension applied to the prepared wound by dripping and capillary action under the Telfa® Clear dressing. The donor site was sutured and moist dressings applied. Finally, compression dressings were applied. All patients returned 1 week post-treatment to have their outer dressings removed, taking extreme care not to disturb the wound bed. The ulcer was redressed with moist dressings and compression therapy. At 2 weeks post-treatment patients reported a decrease in pain; exudate decreased; and there were areas of (fragile) granulation and re-epithelialization. At 6 weeks post-treatment a noticeable change in the patients’ healing trajectory was observed and wound sizes had decreased. A second treatment was considered for patients who had not healed by 40%. At 10 weeks, depending on the original size of the wound, the majority of patients were on their way to wound closure. Dressing techniques remained the same and changes depended on wound size and exudate. At 14 weeks post-treatment, some patients had fully healed. The new skin was very fragile but the patients were compliant with compression therapy and wounds remained closed. The usual healing time for VLU in compression is 24 weeks [9, 10] and Mrs Curran remarked that many of the patients healed before this point. She stated that it is essential that blood flow is restored to the affected limb where possible and prior to any other treatments (including cell suspension), to heal the wound and avoid ulcer recurrence. In Mrs Curran’s clinic, the VLU patients treated with cell suspensions saw significant decreases in wound size, and a decrease in pain and exudate with resultant improvements in QoL. However, she is clear that patient compliance is key to success, along with good follow-up care and regular dressing changes. Day 2 of the Symposium was opened with a keynote presentation from Dr Nik Georgopoulos (University of Huddersfield, UK). Dr Georgopoulos’ research uses biological models to explore, at cellular and molecular levels, the underlying mechanisms of action of pharmaceuticals and medical devices in disorders such as chemotherapy-induced alopecia and defective wound healing. Much of Dr Georgopoulos’ work relates to understanding cell signaling and how cells grow, divide, move and specialize. Skin is very complex tissue with various components, and a specific organization to allow it to perform certain functions. Cells express specific proteins, driven by cell location. Basal cells have different properties and express different proteins to those in the higher layers of the skin. These cells rapidly divide and differentiate as they move through the epidermal layers, the protein signature changing as they do so. Dr Georgopoulos explained he uses these proteins in his research on normal and defective healing. Research into skin regeneration aims to understand more about the processes of wound healing, looks at ways to harness or enhance it and investigate why various treatments in some patients are ineffective. This in turn builds better therapies and informs the clinician about appropriate treatments for the patient. Dr Georgopoulos explained that it is vital that the skin heals rapidly and from a survival perspective, we have evolved to close wounds quickly, which does not always have the best aesthetic result. Enoch and Leaper  explained the main stages of the process of wound healing – hemostasis, inflammatory, proliferation and remodeling stages – which overlap with each other. Everything is well orchestrated in the wound healing response, but when things go wrong they go very wrong. The presenters discuss treatments and methods to harness and enhance the stages to regenerate good quality skin; however, sometimes the results are less than satisfactory. Research at the Skin Integrity Institute at Huddersfield aims to elucidate why and how wounds fail to heal and in which patients this might occur. Cells are friendly entities that continuously talk to each other. During wound healing there are big changes at the cellular level; the cell needs to be fully reprogrammed. Some of the changes are similar to those seen during embryogenesis. Once inflammation is triggered the immune system aims to balance and control it, and the process is orchestrated to eventually close the wound and reform the intact barrier of the skin. In a chronic wound the process stalls; processes of re-epithelialization (cell migration and proliferation) become deranged. Proteins such as metalloproteases are secreted at the wrong time; fibroblasts become quiescent and senescent; and the skin lacks oxygen. This well-defined process is disrupted and the wound remains open and at risk of infection. In the process of skin healing, the cells signal to other cells and also respond to such protein signals. This is interesting, since multiple pathways communicate to amplify response, activate and speed up the wound healing process. These signaling proteins drive activity, such as the Wnt pathway, which drives stem cell function and renewal, and reprograms differentiated cells to have stem cell-like properties to promote wound healing. These cells are differentiated to varying extents; they have to de-differentiate and they have to move by sliding on extracellular matrix (ECM), and are completely rewired at the transcriptional level – the genes and proteins expressed change. When it comes to how the cell communicates, there is a cascade of events in which a number of proteins will relay this message. Proteins become phosphorylated and these events allow them to relay the message sent to the nucleus – transcription factors are activated and this allows the new expression of genes to promote healing. Specific proteins allow contact, but also tell the cells how to behave (move, stay put, divide). Growth factors can be considered the driving force of wound healing, but their use as a monotherapy in the clinic has not worked well. The use of human serum (a soup of factors), however, helps keratinocytes but is detrimental to fibroblasts; human serum contacts TGF-β3, which suppresses fibroblasts. HSP-90 can constitute up to 3% of a normal cell’s protein content. This protein can be released during stress and released by specific cells to override TGF-β3. Therefore, it seems that HSP-90 could be the driving force of wound healing because factors released in the wound allow epithelization. HSP-90 starts to accumulate, reaches a threshold and overrides signals to allow the next stage to proceed. Dr Georgopoulos and his team have used the ReCell® process to investigate the cells and signals found in RES, including a number of the pathways discussed in the presentation. They have found RES exhibits a protein/signal profile expected in cells freed from contact inhibition, and in a proliferative and migratory state. They are continuing their research into how RES works with the goal of applying their findings to the clinical setting to aid the clinician in making an informed decision to select the right treatment for patients.